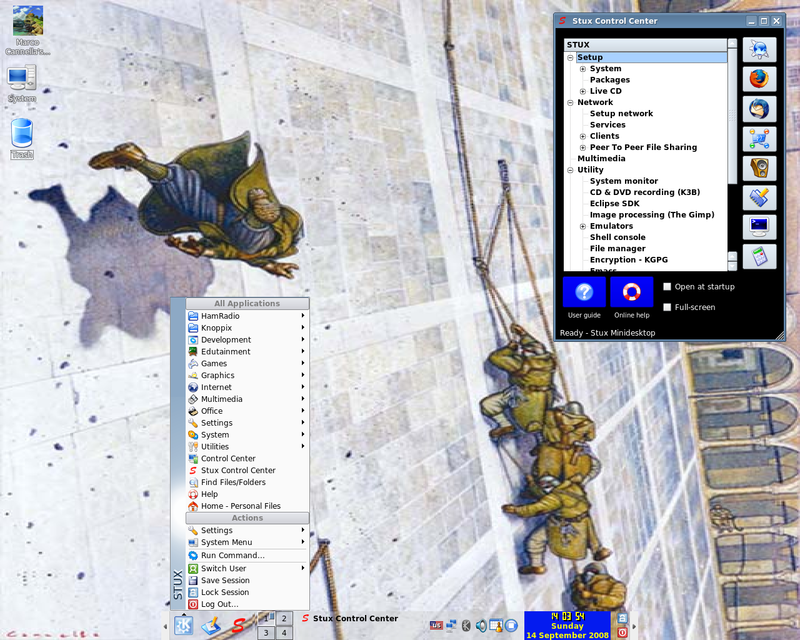 Mayix was a Gentoo-based Linux live CD with GNOME as its default desktop. The project also develops a "stage4" CD, which allows users to install a full Gentoo Linux desktop system in under one hour. Rate this project STUX GNU/Linux 1.0, a live CD based on Slackware's "current" tree, has been released: "STUX GNU/Linux 2007 (version 1.0) released." From the changelog: "Upgraded to Slackware current as at 1 Jun 2007 and KNOPPIX live CD 5.1.1 (kernel 2.6.19); fixed problem with installation on SATA hard disks; all STUX utilities deeply reviewed; NVIDIA proprietary driver updated to 1.0-9755 + legacy driver 1.0-9631 for old cards; save live CD persistent configuration on ReiserFS partitions; install compressed image on ReiserFS partitions; Acx wireless firmware upgraded; fully integrates with other pre-installed operating systems; Compiz 0.5.0; fully VMware/QEMU compatible." Visit the project's news page to read the release announcement and changelog. Download via BitTorrent: stux-linux-1.0.iso (696MB).